Note: I am a newbie so if this post doesn't exactly fit the website, please excuse my lack of experience or maybe lack of judgement. 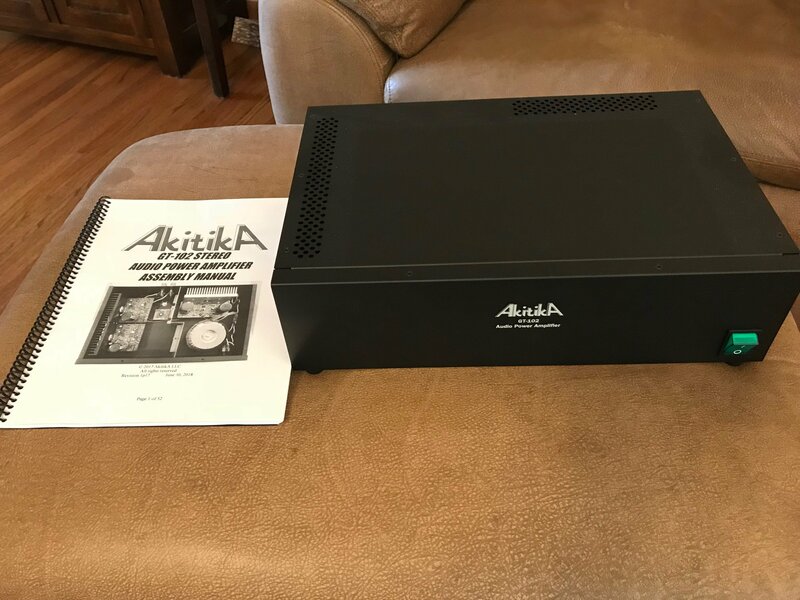 So, I saw an article in Stereophile sometime back about a solid state amp by Akitika.com that could be built at home similar to a Dynaco or Hafler. Stereophile gave it a really favorable review, so I decided to give it a try. The kit cost me $340 all-in including shipping, plus about an additional $50 in soldering tools and materials. You can buy it assembled for a little over $500, but I opted to watch a few Youtube videos on soldering and take the plunge. It was surprisingly easy to build the kit and the assembly instructions are incredibly detailed. I don't know how many hours I actually had in it, but I did it in my spare time and enjoyed it. My soldering looks like crap, but it works! It's worth pointing out that the fellow who sells this kit (Dan Joffe) backs it with awesome support and he sources as much material from USA manufacturers as possible. In addition to his well documented assembly manual, he answered about two dozen questions I emailed him. Plus, he walked me through fixing a couple of mistakes I had made. I should mention I had never soldered anything aside from plumbing fixtures before this. So you are probably asking, "How does it sound?" The answer is surprisingly musical! It doesn't sound quite like a tube amplifier, but it is pretty neutral and really pairs nicely with my Cornwalls. It also sounds good on my KG 5.5s, but the Cornwalls really bloom with this amp. I was surprised when the music came out sounding pretty close to my little First Watt J2 (Nelson Pass designed amp). I am not saying it's the equal of the First Watt J2, BUT considering it cost me about 5x less, I find myself impressed. It certainly sounds better than my mid 1980's Denon gear, which is still pretty nice stuff. So, if you are looking for a fun project to do by yourself or with your kid, this just might be the trick. 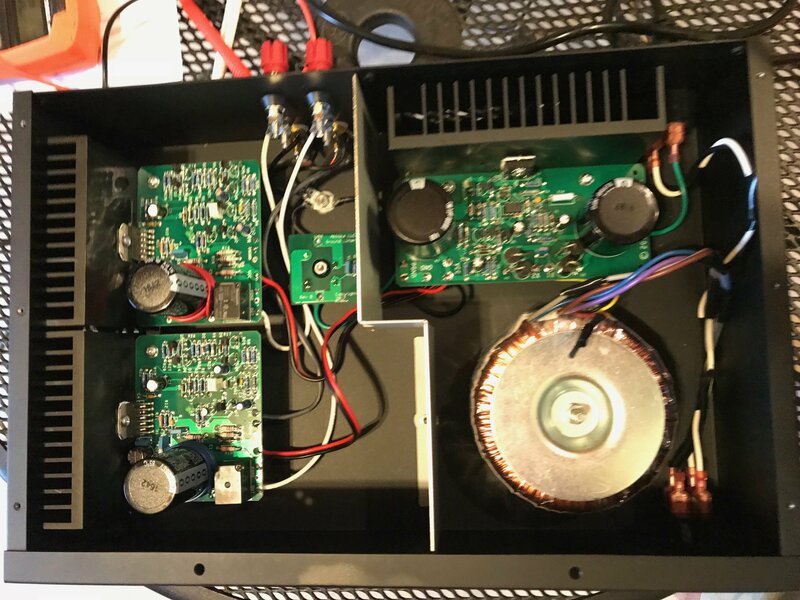 Plus, if building this kit with a family member hooks them on 2-channel hi-fi and gets them to pair the amp up with some of PWK's fine products, then that in my mind is a project worth doing. Gotta get the next generation interested in real hi-fi! Here are a couple of links which will take you to the Akitika web page and the Stereophile review. P.S. Here's a picture of the finished product. Did any of the boards come with any parts on then or did you have to install everything onto them? And do you have any photos of it before you started the build?